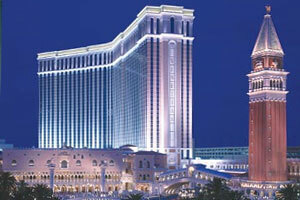 Experience the romance of Italy in the heart of the Las Vegas Strip. Beauty and grace surround you at The Venetian Resort Hotel Casino, where every detail has been carefully designed to provide you with a memorable stay - from the world’s largest standard suites to the city's most elegant casino. Immerse yourself in the enchanting atmosphere of this all-suite Las Vegas hotel resort. Choose from 19 remarkable restaurants - featuring an unprecedented six James Beard Award-winning chefs, including Wolfgang Puck, Emeril Lagasse, and Thomas Keller. Browse the 80 international boutiques of The Grand Canal Shoppes, offering collectibles and couture from such renowned names as Jimmy Choo, Lladro, Dooney & Bourke, and Burberry. Rejuvenate at Canyon Ranch SpaClub - the very picture of rest and relaxation - where a full-service salon, fitness center, rock-climbing wall, and indulgent packages await. Discover the ideal Las Vegas resort vacation destination and business retreat - where exquisite all-suite accommodations, attentive service, and endless attractions converge in a magnificent setting.